If you are struggling with finding a wheelchair training or exercise equipment that you can use in the comfort of your home the Mclain Wheelchair training Rollers available at Sportaid is exactly what you are looking for. It offers you convenience combined with the highest levels of practicability. In addition, it is easy to assemble with only hand screws and nothing else. These and other features that I will share in details next are what makes it a must-have. It accommodates both regular and sports wheelchair. 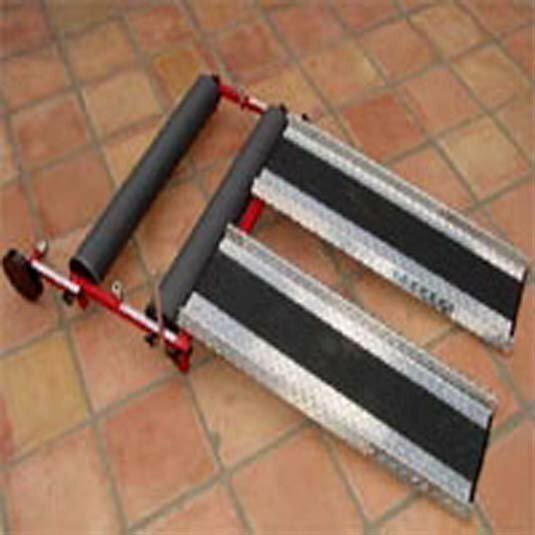 The Wheelchair Training Rollers can easily access ramps. Besides, it can be easily folded hence easy to transport and also store. The legs are adjustable; your comfort is guaranteed with this feature. Your safety is not compromised with the brakes that the Rollers has, getting on and off the roller is not a risky venture. The Wheelchair Training Rollers come with Training Roller drums that allow for three sets of speed. And that is not all, it also has 32-inch wide lathe turned drums that further enhances its performance. The Wheelchair Training Roller is sturdy thanks to its solid construction. It is easy to use and set up. You do not need tools to assemble it. The design of this product is amazing; it is easy to move out of the way when needed and easy to use while watching TV. It may take you some good amount of time to assemble it though it’s not too difficult. This incredible Training Roller is available at Sportaid and as with all of their other products, it’s at a pocket-friendly price. And did I mention that they have top notch customer service? Get to enjoy rock bottom prices coupled with the best customer service at Sportaid.